Microsoft's Kumo: already a step behind? (CNET) -- Once again, Microsoft is finding itself beaten to the punch in the search game. 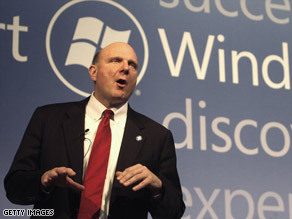 Microsoft CEO Steve Ballmer may be ready to unveil search engine Kumo as early as next week. While it has been readying Kumo for its first public airing--probably at next week's D: All Things Digital event--Yahoo and Google have already shown off their latest search enhancements. Worse still, their demos show that Redmond's rivals are heading in some of the same directions as Microsoft itself. According to screenshots that leaked out in March, Kumo's look focuses on a new left-hand navigation menu that breaks searches down into a number of related queries. The results themselves also feature information organized into categories. For example, a search on "Audi" breaks things down into an initial result with facts such as price and fuel economy pulled out in bold, followed by general Web results, then results by category, such as Audi parts, used Audis, and Audi accessories. But in the time since those screenshots leaked and Microsoft began internal testing of Kumo, Yahoo and Google have also continued to advance their efforts. Last week, Google showed off new ways of filtering results at its Searchology event. On Tuesday, Yahoo talked about trying to return more instant results, as opposed to just linking to sites that might have what a user is looking for. Yahoo even used Microsoft's favorite catch phrase. "It's time to kill the 10 blue links," said Prabhakar Raghavan, head of Yahoo's search strategy, referring to the top 10 search results listed when you enter most queries into a search engine. "We want to move away from document retrieval as center of search to divining the user's intent." The Kumo revamp includes more than just a new user interface and is also expected to include enhancements in video and image search as well as technology from Powerset, a natural-language search company Microsoft bought last year. The need for Microsoft to make headway is critical. After four years in the business, Microsoft continues to tread water as a distant third in the search market. Even within its own walls it hasn't been able to command a majority of searches. In the broader market, the company has struggled to achieve a double-digit market share. In April, the company had 9.9 percent of the U.S. search market, according to Nielsen Online. That compares to 16.3 percent for Yahoo and 64 percent for Google. The effort has also been a drag on the company's overall earnings as it has continued to pour billions of dollars in profits from its Windows and Office businesses into the money-losing online push. Last quarter alone, Microsoft's online services business had a $575 million operating loss on revenue of $721 million. Search is key for Microsoft--and everyone else in the business--because it is where much of the online money is made today, as opposed to services such as e-mail or instant messaging, which generate relatively paltry amounts of revenue. Microsoft is counting on Kumo to help the company improve its fortunes and prove that the years-long investment in search will finally bear fruit. However, some are less than optimistic that Microsoft can make headway. "The battle for general Web search is all but over--or at least the formation of the landscape for that," said Ned May, the lead analyst for Outsell, an analysis firm that focuses on the information and publishing industries. "It's Google, Yahoo, Microsoft--in that order." The launch of Wolfram Alpha shows that the public is still hungry for additional alternatives, May said, but added that at this point new advances are quickly copied, limiting broad-scale changes in the market. May noted that Microsoft is rumored to be planning a $100 million ad campaign to promote its search improvements. "That speaks to what it's about today," May said. "They need to spend $100 million to move the needle in their direction. That speaks volumes." Microsoft won't say when Kumo will be available publicly, or in fact whether it will keep the Kumo name or go with one of the reported alternatives, such as Bing. Although Microsoft may well show Kumo at D, the public launch is still a bit further off. A clock at Microsoft, said to be counting down the days until Kumo's launch, won't be done ticking in time for the News Corp.-owned conference. By my rough calculations, that should have the clock standing at somewhere around a dozen days from today. As others have also noted, that coincides with June 3, the start of SMX Advanced, where Microsoft's Qi Lu is speaking. Meanwhile, Microsoft has been testing some Kumo-like navigation features in recent days. May said that the changes being talked about make sense, but may not be enough to help Microsoft stand out. "That's good stuff," he said, but added that Yahoo already does a good job of things like suggesting additional searches. "It's already being done pretty well by the others."